Microsoft has just wrapped up its two and a half hour keynote at its annual Build conference in San Francisco. Here’s a recap of what the company discussed in its kickoff. Starting off the event, Microsoft announced that 270 million devices are running Windows 10, with 500 new devices designed for the operating system. It even made a jab to Apple’s comment on five-year-old PCs, saying it has built software to cater to everyone. Calling it an anniversary update, Microsoft will be rolling this out for free this summer for up to 4 million devices. New features include fingerprint authenticity, HoloLens, and improved Cortana and pen support. For example, writing “tomorrow” in a memo means Cortana can recognize the word and offer to add it to your calendar. Universal apps for popular services like Instagram, Facebook, and Messenger are also headed to Windows 10, and will give advertisers more opportunity to reach the Windows audience (yay?). The Windows Store has been visited over 5 billion times, the company said. On the dev end, Microsoft announced an update to Visual Studio, the anniversary update SDK, and that Bash is coming to Windows. It also demoed what it’s like to develop for Windows 10 – touting a 60FPS feature so designers can add a rich animation into their apps. Microsoft will also offer a desktop converter to port Win32 apps as a modern application. Moving over on the gaming end, Microsoft showed off how Universal Windows Platform is going to help devs with creating games for Windows 10 and Xbox One. It did so with the announcement of Xbox Dev Mode, so you can take any retail console and turn it into a developer kit. Cool! All devs have to do is download the app and register the console as a developer account so they can deploy and debug their app(s) via the Xbox One. This is helpful to check if your app is optimized for the living room. The preview of the Dev Mode is available today. Other updates? Cortana is coming to Xbox, the Windows and Xbox stores will now be unified into one place so you have a one stop shop for your app download needs, and a new DirectX 12 is graphics API should improve GPU performance for gaming. To kick off the HoloLens portion of the keynote, Microsoft announced that the developer edition of the HoloLens will begin shipping today. All of the code associated with the platform will be available on GitHub. Microsoft showed this off with a medical education-related demo (just like last year), with an AI named Mark to narrate and teach students the human anatomy. Windows developers can also check out Destination Mars, a NASA-partnered program to explore the Red Planet via the HoloLens. Microsoft moved quickly to instead showcase new Cortana updates, such as asking her questions straight from the lock screen. You can also say things like, “Send Ben the document I was working on last night,” and she will look up your most recently edited file to see whether that’s what you’re referring to. Cortana can tell science-y jokes too. She can also look for receipts in your email when you’re on a work trip to remind you to file your expenses, and can get it into a Microsoft Expense Management application to send it off. That sounds wildly useful. Devs can also build “Proactive Actions” on Cortana, like asking her about a store you visited this time last year and using location data history to suggest answers. Microsoft will offer invitations for devs to build these actions today via the Cortana Developer Preview. Nadella says he wants to use services like GroupMe and Skype as “conversation canvases,” adding bots and holograms to bring Skype to the next level. In a demo, Skype shows how you can add video messages in a chat thread, along with a transcription of what was said in the video underneath. Cortana can also use Skype to interact with customers in a bot-like manner – pretty much like what Facebook Messenger has been doing with businesses when it launched its API last year. Naturally, this means a Skype Bot SDK will be available, and devs can integrate it into both audio and video experiences. The bots will also come to Skype for Android, iOS, and HoloLens in addition to Windows. Continuing on this bot trend, Microsoft announced the Bot Framework to connect bots to most major messaging apps and teach them to better understand natural language. Devs can also browse a bot directory to find ones with the functionality you’re looking for, and there’s an SDK on Github too if you don’t know how to get started. Yes, there’s a Domino’s Pizza Bot if you’re into it. Both the Bot Framework and Skype Bot are available today. You can also use Microsoft’s Cognitive Services to browse through 22 free APIs to integrate into your product. For a look at what we’re seeing from the conference, check us out on Twitter via #TNWatBuild. 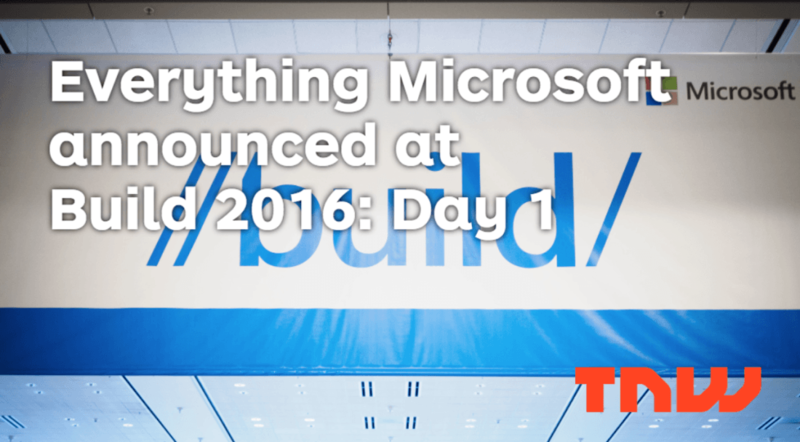 We’ll be back tomorrow for our full coverage of Build 2016, day 2.